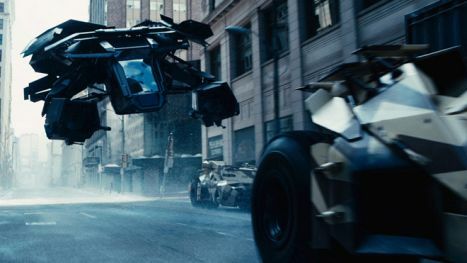 The Bat is a prototype helicopter-type air vehicle that Wayne Enterprises was developing for the Department of Defense. It has a helicopter rotor beneath the craft that would not provide lift. The problem is no air can pass through the blades to provide lift via the Bernoulli Principle. It would never get off the ground. Moreover, it doesn't have a tail rotor to offset the torque from the main rotor. There are some kind of rotors in the front left and right of the aircraft, but they appear to be pointing in the wrong direction to serve as stablizing rotors. Nice look for the movies, but would not work in the real world.